A main focus of this blog is to consider and compare different political and ethical philosophies so as to promote better understanding of one’s own worldview and those of others. I frequently focus on progressivism/liberalism and libertarian conservativism, arguing that these incompletely overlapping moral/political philosophies each have their own internal logic and validity, but that when viewed from the perspective of the other, each is libel to look stupid and/or even evil. How much do you notice the politics of your fellow city dwellers? In a few months I will be moving to California for my first job as an Occupational Therapist (Edit: This never happened. – Ron – December, 2012). 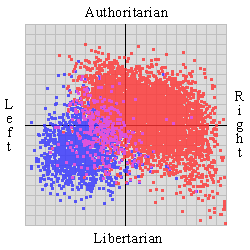 During my job search a key factor I considered was the political leanings of cities. As a politically oriented progressive atheist I applied to positions in Vancouver, Victoria, Seattle, Portland, Eugene, San Francisco, LA, Anaheim, San Diego (yes, I know that SD is relatively conservative, but still California), Hawaii, Halifax, Toronto, and various other locations in Ontario, Canada. By contrast, I did not apply to any postings in Texas, Alabama, Florida, or Utah, and only applied to a couple in Alberta. Liberal bias much? Much too much. And I’d do it again. Here’s what’s interesting. I currently live in London, Ontario, a city which I’ve heard referred to as “ultra conservative” (at least by Ontario standards) on several occasions. I’ve never really felt like I live in a conservative city. There was one time when I went to an Ann Coulter speaking event in London and was pretty stunned by how many far-right conservatives came out. But by the same token, I’m sure that if Michael Moore had come to town, I’d have been surrounded by Lefties. The Coulter event was the only time that I’ve ever felt like I was in a conservative space. On the other hand, I have been living in London as a graduate student. Liberalism tends to run high in universities. Furthermore, the occupational therapy field can be argued to be left-of-centre at its core. These have no doubt been key factors in affecting the degree to which I perceive myself to be living in a conservative city. How much do the political views of a populace leak into day-to-day life? If you live in a liberal city or town, to what degree does it feel liberal? The same for conservative cities and towns. In this month’s Canadian federal election, abortion was not an issue. However, whenever election time roles around in North America, the issue of abortion tends to garner at least a little bit more conversation than normal, even if it is not a specific policy issue. Social conservatives will want to elect politicians who may one day make it a policy issue again, if and when they get enough people in office to be able to make an effective policy run. Pro-choice citizens, on the other hand, are made nervous by the prospect of that happening, and thus are libel to remain slightly weary even when the leader of the conservative party clearly states that he has no interest in bringing abortion back to the table, as Canadian Prime Minister and Conservative Party leader Stephen Harper has done. Given that the Harper’s new term will see the appointment of multiple new Canadian Supreme Court justices, some may be wondering if abortion could be the subject of further political discussion some time down the road. In the video below, Dave Koller talks about a new movement that he has taken part in, wherein participants take it upon themselves to move copies of George W. Bush’s new book on his presidency to the True Crimes section of the bookstore. In response to the Democrats taking a beating in the Midterm Elections, Cenk gave a great call to action against the Democratic Party establishment. The Young Turks’ popularity and viewership just keeps growing. Yesterday they announced that Cenk will be hosting on MSNBC every weekday for at least an hour for the grand majority of November. Today they announced that in the month of October, TYT YouTube videos were viewed over 20 million times – a new monthly record. I hope he brings his A-game on MSNBC. He’s done great a bunch of times since the summer, but I think he came off more as a Big Media TV news commentator than as Cenk “Keep It Real” Uygur in his recent guest host appearance on Countdown, with Keith Olbermann away. Just because one does not believe in a God, Gods, karma, reincarnation, astrology, L. Ron Hubbard, or eighteen year old “elders” who knock on your door on Sunday mornings to bring you the good news from Utah, that doesn’t mean that they are not religious. I don’t know that I’ve ever met an atheist who wasn’t religious in their own way. I certainly am. Like other atheists, I subscribe to a sort of religion that is both different and similar to what we conventionally refer to as “religion”.